Wednesday after baseball practice some of the baseball team(s) all went to a grassy field in a local neighborhood to watch The Big Kaboom fireworks. We all brought snacks and ordered pizza and let the kids all eat and run around before the fireworks started. 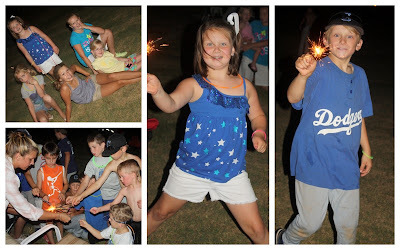 One of the moms brought sparklers for the kids which they all loved... made me a nervous wreck b.c I just knew someone was going to get burned but thankfully that did not happen! It was a good time!